Just when you thought Vancouver couldn’t be any more beautiful, spring arrives and 40,000 cherry trees bloom, seemingly suspending the city in clouds of pink, fluffy petals. Cherry blossom season is definitely a photographer’s dream, but venture a bit farther afield and you’ll find gorgeous blooms of many varieties across the southern region of BC. Here are a few regional highlights to check out this season. 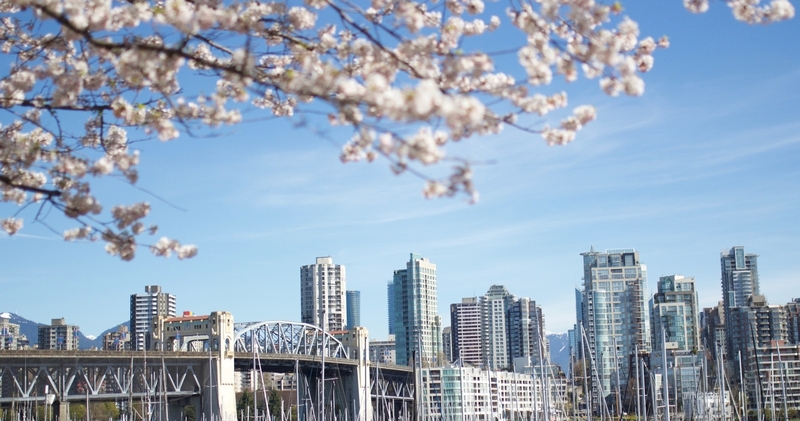 The city’s unofficial harbinger of spring, the Vancouver Cherry Blossom Festival happens every April. Activities include “Tree Talks & Walks,” guided tours through various cherry tree blooming neighbourhoods, and “Spring Lights and Illumination,” a mixed-media and experiential performance under the blossoms in Stanley Park. If you prefer to view blossoms at your own pace, Queen Elizabeth Park boasts several varieties of cherry trees that bloom at different times so you have a large window for viewing. For a classic shot of the pink flowers, Stanley Park shouldn’t be missed—try the area by the Rose Garden. And VanDusen Botanical Garden has more than 100 cherry trees along with special activities, including the annual Sakura Days Japan Fair, part of the Vancouver Cherry Blossom Festival. Or, grab a bike and head down W. 22nd Avenue between Arbutus Street and Carnarvan Street, which is especially spectacular at sunset. And W.16th Avenue between Maple and Granville streets provides great juxtaposition of pretty pink against four lanes of traffic. Lovers of colourful tulips should head into the Fraser Valley. The Abbotsford Tulip Festival traces its history back to when a Dutch immigrant, 50 years ago, first planted gladiolas, then tulips, daffodils, and peonies. Today, every spring his granddaughter turns a four-hectare (10-acre) farm into colourful fields with more than 2.5 million tulips from 50 different varieties. This third-generation farm is one of two stops along the area’s aptly named Fraser Valley Tulip Trail. The Chilliwack Tulip Festival is the second must-see site and is Western Canada’s largest tulip festival; it also includes fragrant hyacinths and golden daffodils, grown by a family of Dutch bulb growers dating back to the 1940s. Come back later in the summer for its sister bloom fest, the Chilliwack Sunflower Festival. There’s a reason why Victoria is known as the Garden City. In fact, while the rest of the country is still snow-bound in early March, Victoria conducts its annual, light-hearted Flower Count. Last year Greater Victoria residents counted nearly 3.5 million blooms. Many of these you can see just by walking through Beacon Hill Park or through neighbourhoods like Fairfield or James Bay. For something more manicured, The Butchart Gardens with its many themed displays is a classic Island visit. For stately panoramas, Abkhazi Garden won’t disappoint, with its magnificent Garry oaks, Japanese maples, mature rhododendrons, and naturally terraced landscaping, all lovingly cultivated by Prince and Princess Abkhazi until their passing. If you’re on the east coast of the Island near quiet, charming Qualicum Beach, Milner Gardens and Woodland offers 28 hectares (70 acres) of oasis in a forest setting. If you need to walk off a few too many dumplings while in Richmond, Garry Point Park hosts Richmond’s own Cherry Blossom Festival, showcasing 255 Akebono cherry blossom trees. Minoru Park is a hidden gem in the middle of the city with multiple formal gardens including the Pierrefonds Gardens, a French classical-style sunken garden featuring roses. And if your time in the city is too fleeting to make any stops at all, schedule your visit just right and your view to and from the airport could be filled with cherry and magnolia blossoms trees, which line many of the streets near YVR including Grant McConachie Way and Hazelbridge Way. Catherine had explored Petra, climbed the Great Wall and rescued Icelandic pufflings before even considering a career as a travel writer. She now sits on the Travel Media Association of Canada board and explores the world, writing about her adventures. She specialises in luxury travel, spa, food, soft adventure and style. The largest gathering of wintering eagles in the world takes place within a few hours of Vancouver. Classic winter activities like snowshoeing and cross-country skiing bring couples together in BC's Cariboo Chilcotin Coast.